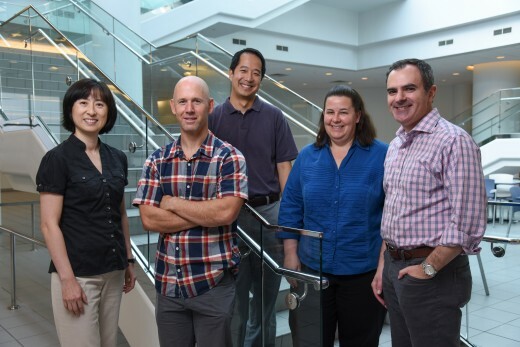 UT Southwestern faculty members named Faculty Scholars (l-r) include Dr. Elizabeth Chen, Dr. Neal Alto, Dr. Benjamin Tu, Dr. Julie Pfeiffer, and Dr. Ralph DeBerardinis. DALLAS – Sept. 22, 2016 – Five UT Southwestern Medical Center researchers are among 84 scientists from 43 U.S. institutions chosen as Faculty Scholars, a new grant program of the Howard Hughes Medical Institute (HHMI), the Simons Foundation, and the Bill & Melinda Gates Foundation. The program, a first-time collaboration of the philanthropies, awards grants of $600,000 to $1.8 million over five years to early-career scientists with great potential to make unique contributions to their field. Distinguished scientists evaluated 1,400 applications and selected the Faculty Scholars based on prior research, current investigations, and future potential for bold, innovative investigations. UT Southwestern tied with three other institutions for the second highest number of researchers receiving this award nationally, and had the highest number of awards of any Texas institution. “These Faculty Scholar awards are a testament to both the creativity of these philanthropies in finding new ways to support high-caliber research and to the talents of our faculty members who received them,” said Dr. David Russell, Vice Provost and Dean of Basic Research at UT Southwestern, who also holds the Eugene McDermott Distinguished Chair in Molecular Genetics. Dr. Neal Alto, Associate Professor of Microbiology and a Rita C. and William P. Clements, Jr. Scholar in Medical Research, has been selected as a HHMI-Simons Faculty Scholar. Infectious bacteria use toxins called effector proteins to invade host cells. Dr. Alto studies how these proteins operate, with an eye toward uncovering new therapies to combat diseases caused by Escherichia coli, Shigella, Salmonella, and other microorganisms. He also seeks to harness effector proteins to explore the causes of autoinflammatory diseases and cancer. Dr. Julie Pfeiffer, Associate Professor of Microbiology and now an HHMI Faculty Scholar, discovered that gut bacteria can inadvertently advance enteric viral infections by influencing viral replication and transmission. Now, using poliovirus and reovirus as models, Dr. Pfeiffer is exploring this connection further to better understand how viruses in general may depend upon intestinal bacteria for their survival. “I am thrilled that Dr. Alto and Dr. Pfeiffer have competed successfully for these outstanding, prestigious awards. Both are eminently deserving as a result of their bold, avant-garde approaches for advancing new scientific concepts in the fields of infectious diseases, cell biology, and cancer,” said Dr. Michael Norgard, Chairman of Microbiology and holder of the B.B. Owen Distinguished Chair in Molecular Research. Dr. Elizabeth Chen, Professor of Molecular Biology and Cell Biology and now an HHMI Faculty Scholar, investigates what happens along the membranes of undifferentiated muscle cells, or myoblasts, during cell fusion, a crucial step in skeletal muscle development and repair. Her work has shown that mechanical tension drives the fusion process as one cell invades another using fingerlike protrusions of the cell membrane. “Through elegant genetic studies in fruit flies, Dr. Chen has discovered key genes involved in muscle formation across a wide range of organisms. Her work has important implications for strategies to regenerate and repair damaged muscles in numerous human muscle disorders,” said Dr. Eric Olson, Chair of Molecular Biology and holder of the Robert A. Welch Distinguished Chair in Science, the Pogue Distinguished Chair in Research on Cardiac Birth Defects, and the Annie and Willie Nelson Professorship in Stem Cell Research. Dr. Ralph DeBerardinis, Associate Professor at the Children’s Medical Center Research Institute (CRI) at UT Southwestern and a newly named HHMI Faculty Scholar, studies the metabolic pathways that go awry in cancer and other diseases. He hopes to develop therapeutic agents that selectively manipulate tumor metabolism, reducing tumor growth while leaving the body’s metabolism elsewhere undisturbed. At UT Southwestern, Dr. DeBerardinis also has appointments in the Eugene McDermott Center for Human Growth & Development and in Pediatrics, is Chief of the Division of Pediatric Genetics and Metabolism, holds the Joel B. Steinberg, M.D. Chair in Pediatrics, and is a Sowell Family Scholar in Medical Research. As a physician-scientist, he also diagnoses and treats genetic metabolic disorders in children. “Ralph is one of the best young cancer metabolism researchers in the country, as well as a clinical leader in the diagnosis and treatment of inborn errors of metabolism in children. He is making transformative scientific discoveries, and pioneering new approaches in the clinic,” said Dr. Sean Morrison, CRI Director, Professor of Pediatrics at UT Southwestern, a CPRIT Scholar, and an HHMI Investigator. Dr. Morrison holds the Kathryne and Gene Bishop Distinguished Chair in Pediatric Research at Children’s Research Institute at UT Southwestern and the Mary McDermott Cook Chair in Pediatric Genetics. Dr. Benjamin Tu, Associate Professor of Biochemistry and a W.W. Caruth, Jr. Scholar in Biomedical Research, was selected as an HHMI-Simons Faculty Scholar. Dr. Tu is characterizing the mechanism of action of two cell metabolites that are critical for coupling cell growth and homeostasis to nutrient availability: acetyl-CoA and S-adenosylmethionine. These metabolites play a critical role in the epigenetic regulation of gene expression, signal transduction, and metabolism. “Dr. Tu is a consummate biologist, as good as it gets. On top of his skills as an experimentalist, Ben mentors his trainees as well as or better than any scientist I have ever met,” said Dr. Steven McKnight, Professor of Biochemistry and holder of the Distinguished Chair in Basic Biomedical Research. UT Southwestern, one of the premier academic medical centers in the nation, integrates pioneering biomedical research with exceptional clinical care and education. The institution’s faculty includes many distinguished members, including six who have been awarded Nobel Prizes since 1985. The faculty of almost 2,800 is responsible for groundbreaking medical advances and is committed to translating science-driven research quickly to new clinical treatments. UT Southwestern physicians provide medical care in about 80 specialties to more than 100,000 hospitalized patients and oversee approximately 2.2 million outpatient visits a year. The above post is reprinted from materials provided by The University of Texas Southwestern Medical Center.